Fairlee bed and breakfast travel guide for romantic, historic and adventure b&b's. 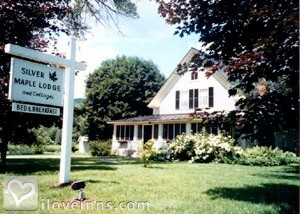 Browse through the iLoveInns.com database of Fairlee, Vermont bed and breakfasts and country inns to find detailed listings that include room rates, special deals and area activities. You can click on the 'check rates and availability' button to contact the innkeeper. Ice skating enthusiasts know what Fairlee, Vermont has to offer. This town in Orange County is the home of Lake Morey, which is said to have the longest ice skating trail in the country. Landmarks include Samuel Morey Pioneer Inventor inscription and The Ridge at Oxford. Lake Morey Country Club is a favorite of golfers visiting the town as well as the locals. Downtown Ely Gardens is a relaxing place for those who want to spend quiet afternoons in Fairlee. Dartmouth Skyway is a popular ski resort in nearby Lyme Center. Innkeepers at Fairlee bed and breakfast inns can recommend the best restaurants. By Silver Maple Lodge & Cottages. Fairlee, Vermont has a number of scenic attractions and venues for fun activities. Visiting couples can go from their Fairlee bed and breakfast accommodations to ride bright colored hot air balloons as they get a view of the bucolic Connecticut River Valley. Visitors who love the outdoors can go mountain biking or hiking on the area's numerous trails. Among the attractions near Fairlee are Quechee Gorge, Calvin Coolidge Homestead, Billings Farm and Museum, Saint-Gaudens National Historic Site, Maple Grove Maple Museum, and the Cabot Farmer's Coopertive. Those who would like to take photos of historic covered wooden bridges can go to Sayres, Flint, and Larkin. For a quiet afternoon in Fairlee, stroll Downtown Ely Gardens. By Silver Maple Lodge & Cottages.